On January 8, 2016 the session ‘Asger Jorn: Thinking in Threes’ was hosted by Circuits and Currents, the Project Space of the Athens School of Fine Art. Two Athens-based artists contributed to this session. Yiannis Isidorou with a performance-text which can be found in the Public Sessions section of this blog, and Kostis Velonis with the text below. Kostis Velonis received his Doctorate in architecture from the N.T.U.A University of Athens (2009). He studied Cultural Studies (MRes) at the London Consortium and Visual Arts at the Paris VIII University, (Maitrise, D.E.A). Recent shows (selections 2014-15): This probably will not work, Lothringer13 – Städtische Kunsthalle München, Munich 2015; Adventures of the Black Square: Abstract Art and Society 1915 – 2015, Whitechapel Gallery, London 2014; The Theater of the World, Museo Tamayo, Mexico City; This is not my Beautiful House, Kunsthalle Athena, Athens; No Country for Young Men, BOZAR, Brussels. As the current conditions in global markets are in a potentially unstable situation the activation of Epicurus’ (341-270 BC) swerve (“Clinamen”) proves to be of some interest, since it introduces us into a mobile and liberating perception of things that corresponds to the risks of the financial hyper-capitalist structure. Epicurus’ positions are firmly opposed to Platonic cosmogony, given that in Plato’s only text on nature, Timaeus, real nature is a perfectly organized structure consisting of geometrical elements, such as spheres, pyramids, cubes, etc. In many ways, quantum mechanics, which describes the behavior of matter on molecular and atomic level, can be interpreted as a continuation of the atomic theory expounded by the philosophers of Atomism (Democritus, Leucippus), of which a late proponent, during the Hellenistic period, was Epicurus himself. The philosopher from Samos tried to relate physics and cosmogony with human nature. We would have to wait many centuries until modern physics confirmed the ancient materialists’ speculation on the atomic composition of matter. Modern physics explains matter recognizing that atoms move in unpredictable directions. Epicurus idea of continually moving atoms that swerve (clinamen), following the inclination of a fundamental randomness, is already confirmed by the history of the discipline of quantum physics. 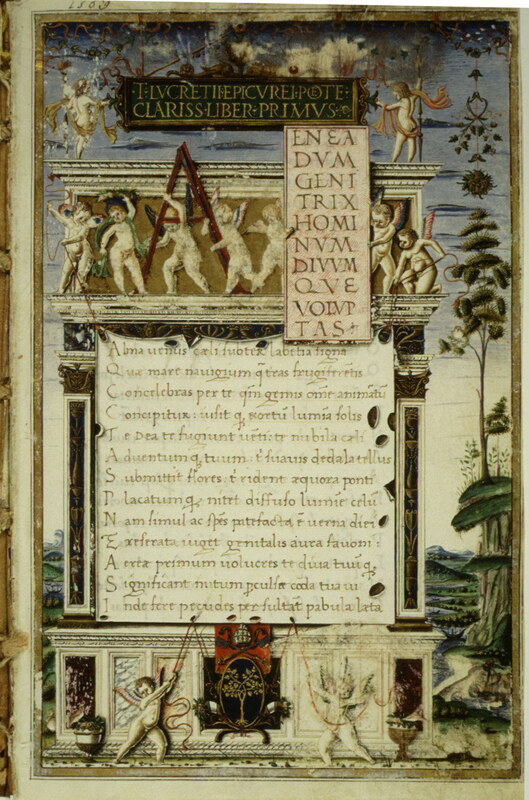 Lucretius, “De rerum natura”, 1483. Copied by Girolamo di Matteo de Tauris for Pope Sixtus IV. Lucretius also examines the issue of the swerve of atoms. He thinks that without this slight deviation of atoms from their usual movement, “all would fall downward through the unfathomable void like drops of rain”, and no contact would be possible, no collision among the original elements, and thus nature would never create anything at all. Lucretius wonders: “…if new movements arise from the old in unalterable succession, if there is no atomic swerve to initiate movement that can annul the decrees of destiny and prevent the existence of an endless chain of causation, what is the source of this free will possessed by living creatures all over the earth?”[ii] It is this “natural” deviation that allows a degree of arbitrariness to the universe and thus introduces the idea of contingency. The principle of indeterminacy appears to be important for the practice of creative expression, as it constitutes a field where human freedom can be exercised. This liberating indeterminacy subverts deterministic conceptions, the causal perception of the world through the tyrannical chain of causes and effects, and, finally, the Stoic idea of an unavoidable – according to a common belief – fate. All Epicurean thinkers agree on the idea of a free will that does not obey to fate; that is, a will that determines our actions, beyond any kind of predetermination. The Greek origin of deviation could not have been restricted to antiquity, since it touches upon modern scientific assumptions of physics, and all the more so when one attempts at integrating it with the multifarious logic of modernity. Can this volatile condition of matter, and more specifically of atomic deviation, function as a synecdoche in terms of a theatrical and visual avant garde, through formalist formulations no less? An “oblique” Epicurean “deviation” can be attested in a Promethean personage of modernity, the Symbolist writer Alfred Jarry (1873-1907), as well as in the writings and the visual work of the Situationist Asger Jorn (1914-1973). In Jarry’s play Ubu Roi (King Ubu, 1896), an inhuman, brutal and overgrown major usurps the throne of the king of Poland. During the whole play, Jarry’s antihero covers his head and body with a large robe, on which there is the design of a lengthy spiral that winds up on his belly. The term invented by the French writer for this spiral is la gidouille, which indeed denotes a spiral, though not in the sense of a strict, linear geometrical construction, but in a more relaxed sense, as if it was, materially speaking, a formerly taut and now dilapidated hose. This figure is identified with Ubu’s protruding stomach. 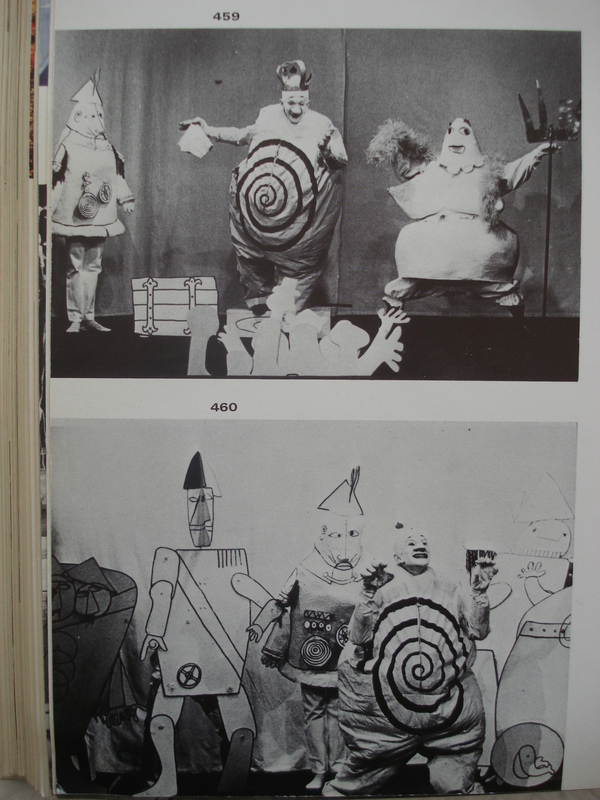 It is interesting to note the relation between Ubu’s body architecture, his gestures and the spiral on his robe. The spiral on Ubu’s belly alludes to the qualities of Clinamen – that is, to deviation from a straight line, to deviant movement. It could be the graphic illustration of an atom’s course in the void, an atom that has completed an elliptical orbit and now springs to infinity, deviating from any calculation imaginable. Ubu, the ambitious major, does not content himself with fate; on the contrary, he follows and asserts his becoming, shaping it in his own way. What matters is how he accomplishes his goals, using base instincts such as passion for crime, an inclination to constant intrigues and all kinds of vices. 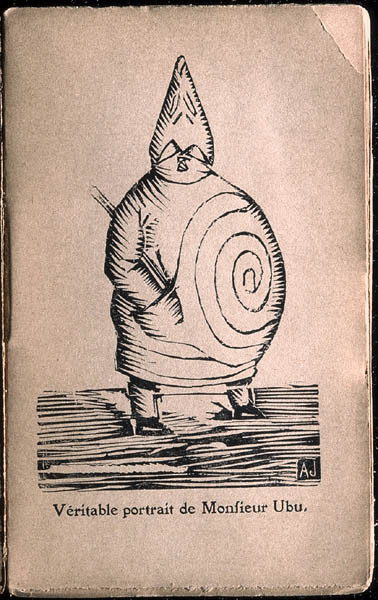 Can the overgrown Ubu, with his ever-expanding belly highlighted by the spiral design, be a model for nihilist thinkers? Since pleasure is so intrinsically ephemeral, we ‘d better not go without it at all: this could be what Père Ubu has constantly in mind before going on with his next brutal act. Not only does not Major Ubu, who usurps the throne of the king of Poland, wish tranquility, but he consciously pursues this fleeting pleasure that, for the anti-conformist Jarry, is an ambiguous model / anti-model of himself. In reality, Ubu is the Physics teacher Félix-Frédéric Hébert, in Jarry’s high school in Rennes, whom Jarry used to make fun of, along with his fellow students, in an impromptu marionette theater. The full-bodied professor Hébert incarnates all the negative qualities that young Jarry wanted to criticize, and in the stories of these French teenagers he becomes King Ubu. Jarry himself refers to the word clinamen, which is the Latin version of Epicurean deviation, in his pataphysical calendar, where it coincides with the month of August. In a less cryptic fashion, the Latin clinamen-deviation is used in Jarry’s 1898 novella Gestes et opinions du docteur Faustroll pataphysicien: Roman néo-scientifique suivi de Spéculations, as a subchapter to describe a painting machine (“Machine à peindre”). An indication of this influence that shows an Epicurean vein in Jorn’s worldview is found in a text entitled “What is an ornament?”(1948), which reveals how close Jorn is to Jarry’s ideas, yet at the same time how much he differentiates himself from them. In this article, he describes “the wave formation matter”, which is the result of the interconnection between the two substances that are active in mutual movement. [viii] The interaction of the different waves through the formalist interpretation can be attributed to the qualities of the arabesque. From the outset, Jorn gives a summary view of his positions for a “grammar of substance” offered by the philosophy of decoration. More specifically, underneath a picture included in his article, he writes: “An ornament? No, a drawing of the orbital paths of a radium atom”.The physical atom as an ornament and the ornament as a construction that obeys to the laws of physics is an opening to a causality of the deviation of atoms and their reflections towards larger forms, which are destined by nature to move dynamically. The ornament is not programmed to repeat itself unchanged; it changes shape according to the circumstances. Arabesques can be perceived as the intelligent system of atoms and molecules, and they even explain the movement of plants in space. Accordingly, “we can observe the flowing seas, the evaporation taking place across both land and water, after which it rises to the heavens only to cool once again and condense to rainwater, falling back to the ground so as to join with streams and rivers where the cycle from sea to clouds will start again”. [x] Jorn offers with explicative lyricism the fundamental values of decoration as a life motif. But do arabesques, the quality of movement aside, also have the logic of deviation, as described by Lucretius with regard to the movements of atoms? Both Jarry and Jorn try to speak, each one in his own terms, about deviation as a fundamental element of free will, which cannot but reflect the Epicurean view of the formation of the Universe. Movements with no connection or movements that deviate from their expected precise recurrence, thus defining what we call contingency, constitute Jarry’s way of philosophizing, through Dr. Faustroll, as well as his nihilistic caricaturizing, through the lame materialist major Ubu. Epicurus’ wisdom is of vital importance for a “deviant” freedom in existential terms. Since all cosmic order springs from this deviation, even the concepts used by the pataphysicians can be moved away from the pragmatist restraint of language, especially if one thinks of Jarry’s exuberant neologisms. [xv] Empirical functions such as a sudden collapse, a violent breakup, a change of course-dislocation, reconstruction or the paradox of love help us, among many others, understand how the Epicurean swerve in physics and philosophy can have an immediate impact on the world of human relations. [i] Lucretius, On the Nature of Things (De Rerum Natura), translated, with an introduction and notes by Martin Ferguson Smith (Indianapolis & Cambridge: Hackett, 1969), Book II, 216. [ii] Idid., Book II, 254. [iii] Despite the similarities between Epicureanism and Cyrenaicism, these two schools constructed very different systems of thought. See Jean Paul Dumont, La philosophie antique (Paris: Presses Universitaires de France, 2003), and W. Windelband-H.Heimsoeth, Handbook of History of Philosophy [Enchiridio Istorias tis Filosofias], Greek translation by Ν. Μ. Skouteropoulos (Athens: ΜΙΕΤ, 1991). [iv] Gestes et opinions du docteur Faustroll pataphysicien: Roman néo-scientifique suivi de Spéculations (Paris: Charpentier, 1911). I quote here the English edition: Alfred Jarry, Exploits & Opinions of Dr. Faustroll, Pataphysician, trans. by Simon Watson Taylor, Introduction by Roger Shattuck (Boston: Exact Change, 1996), p. 88. [v] Jarry, Exploits & Opinions of Dr. Faustroll, Pataphysician, op. cit., p. 88-89. [vi] “Pataphysics … is the science of imaginary solutions, which symbolically attributes the properties of objects, described by their virtuality, to their lineaments”. Ibid., p. 22. [vii] Asger Jorn, “La pataphysique: Une religion en formation”, Internationale Situationiste 6 (August) 1961, p. 29-32; included in Pataphysics: A Useless Guide, by Andrew Hugill (Cambridge, Mass. & London: The MIT Press, 2012). [viii] Asger Jorn, “What is an Ornament?” (1948), in Fraternité Avant Tout: Asger Jorn’s Writings on Art and Architecture, 1938-1958, edited by Ruth Baumeister, translated by Paul Larkin (Rotterdam: 010 Publishers, 2011). [xiii] Lucretius, On the Nature of Things, op. cit., Book I, 1008. [xiv] Asger Jorn, ‘Charme et mécanique, sur le rôle du vandalisme dans l’histoire des arts’, in Asger Jorn “Pour la Forme. Ebauche d’une méthogologie des arts”, Paris, Internatioanle situationniste, 1958. 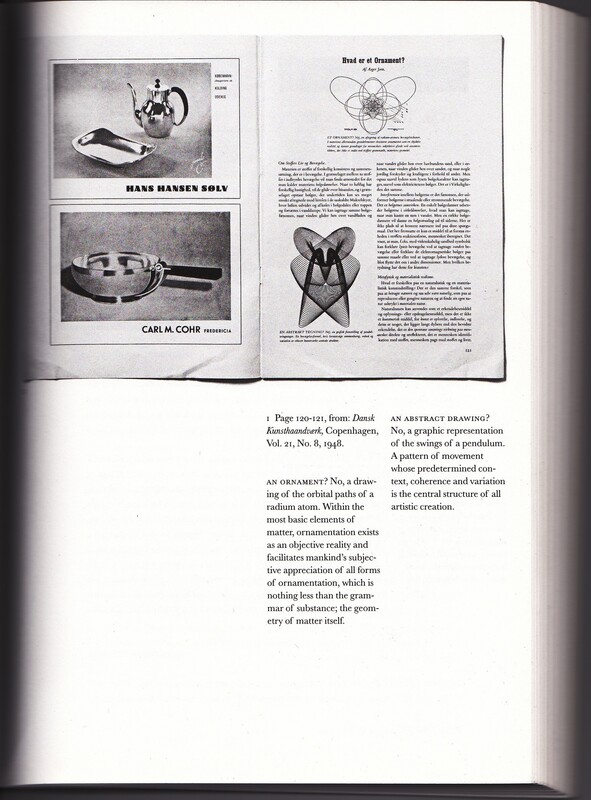 English translation ‘Charms and Mechanisms’, in “Concerning Form”. An outline for a methodology of the arts”, Museum Jorn, Silkeborg, 2012. [xv] It is interesting to note the deviation searched by Michel Serres in the field of language, when he argues that every language is a unique seed, an original distribution of parasites. He even dares to oppose consonants and vowels in order to convey the necessity of deviation. The ideal example is Ubu’s famous “Merdre” instead of “Merde” at the beginning of the First Act of Jarry’s play. Here is Serres’ argument: “Sometimes winds, breaths, composed together incline toward each other without the intervention of valves or consonants. Oui is a coil, a tress of voice. A bit free, a bit loose, undone, without the anguish of strangulation. Oui without the swarming parasites. Oui in the wind of the Paraclete. Oui in the turbulent tresses of the river. Oui finally works itself loose [se desserre]”. Michel Serres, The Parasite [Le Parasite (Paris: Grasset & Fasquelle, 1980)], trans. by Lawrence R. Schehr (Baltimore, Maryland: The Johns Hopkins University Press, 1982). July 9th, 2015, posted in Pataphysics, Public Sessions and Lectures, What is an Ornament?